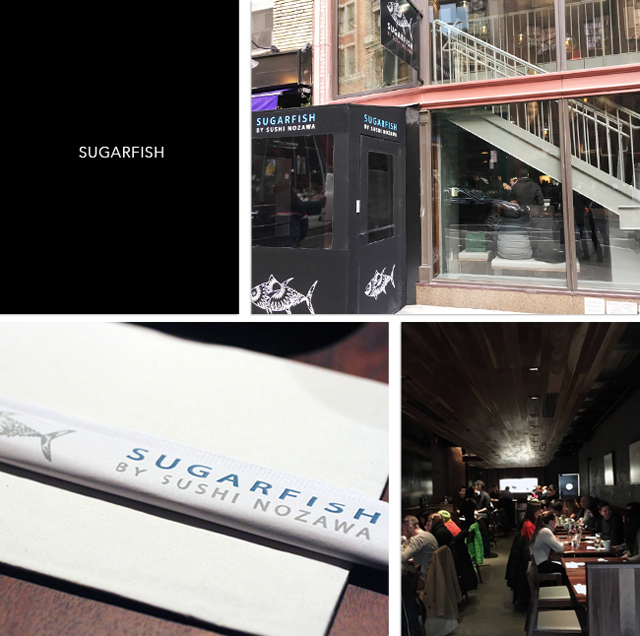 Before touching down in NYC this winter, SUGARFISH by sushi nozawa was already an LA sensation. Famed sushi chef Kazunori Nozawa's popular chain features a straightforward menu that puts the focus on sustainably sourced high quality fish. The Flatiron restaurant which has seen a never ending rush since it's debut is housed in a long wood adorned space with a slightly cavernous feel. Both à la carte and omakase options are offered but the omakase known as the "Trust Me" ($39) that comes with Organic Edamame, Tuna Sashimi, 8 pieces of Sushi, a Toro Hand Roll and Blue Crab Hand Roll is the way to go. With this in mind, we ordered one and the "Nozawa Trust Me" ($51) which includes additional two pieces of the Daily Special sushi. The edamame and tuna sashimi which commenced the meal were palatable but nothing out of the ordinary. The sushi which followed in ritual servings of two was better. The fish was incredibly fresh and each precision sliced piece sat atop a loosely packed mound of warm vinegary rice. I actually want to take a moment to clear up a common misnomer about sushi because sushi is not raw seafood and is in fact the vinegared rice that is often paired with raw seafood. Raw seafood sliced into thin pieces without the rice is known as sashimi. 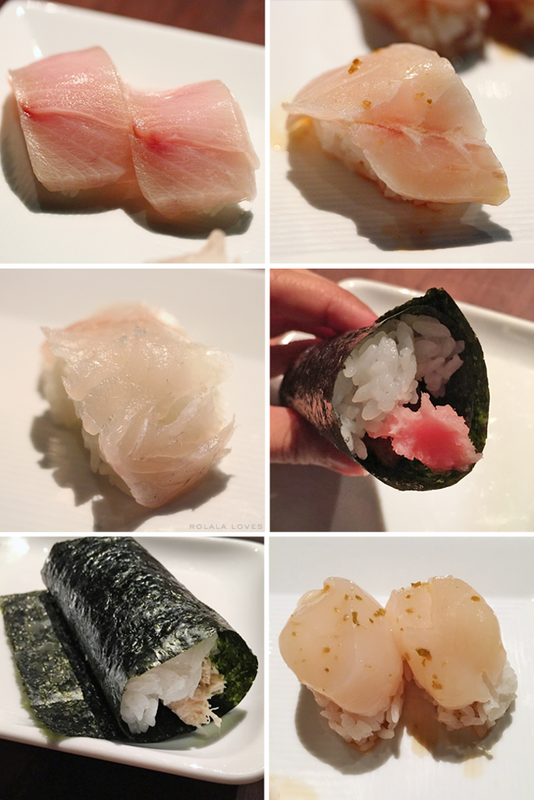 Okay back to my review... Sugarfish takes their sushi seriously and Chef Nozawa's precise process has been painstakingly replicated at their restaurants to get the combination of rice and rice vinegar just right. Interestingly they use small capacity rice cookers like the ones people use at home which they had to get certified for restaurant use. The entire story is actually quite fascinating and you can read it here. The vinegar taste in the sushi is definitely more pronounced here than at most other sushi restaurants and that along with the warmth of the rice results in a really pleasant combination of texture and flavor with each bite. Sugarfish is a real model in efficiency. The service was quick and cordial and dishes would roll out continuously as they were made. They also encourage diners to eat them immediately for the optimal experience. This especially applies to their famous hand rolls so that the nori (seaweed) remains crispy and it really makes a difference. Though their own housemade soy sauce is offered, I found that their sushi didn't need it. 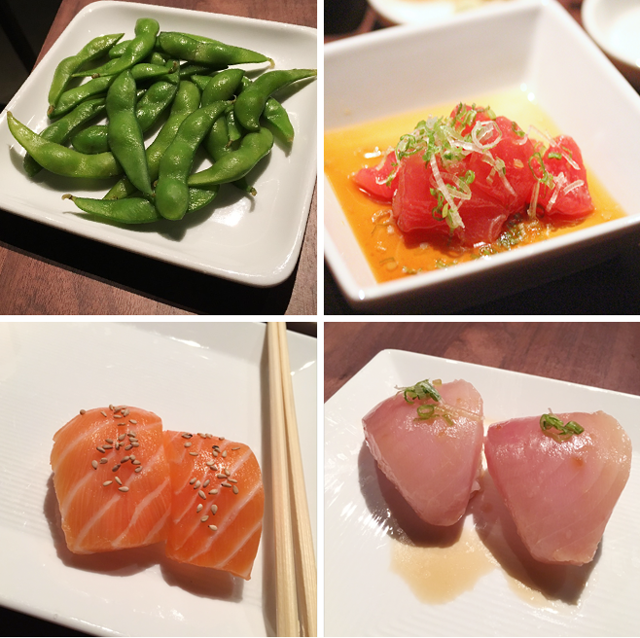 Sugarfish does deliver on their promise for an easily accessible quality sushi dining experience. It's not mind blowing but certainly quite satisfying. Sugarfish is open for lunch and dinner daily. They do accomodate food allergies but do not accept reservations and are a full service, no tipping establishment in which the hospitality is built into their prices. The buzz may have died a little with this place but the lines haven't. A friend of mine who went for dinner last week told me that he had an almost 3 hour wait. This is good quality sushi at a reasonable price and while we enjoyed our experience and would return, I certainly wouldn't wait more than a half an hour. For the record, we went at lunch when they just opened and there was no wait. I think that busy restaurants like this should have reservations and I have never understood why they don't have. Anyway, Sugarfish sounds like a nice restaurant, but 3 hours wait?! No way... Btw, I started noticing the intensity of vinegar taste in the sushi recently after a friend of mine told me about it. Before that I don't think I have ever noticed it. Thanks for sharing your sushi experience in this restaurant, Rowena. It was an interesting read. Have a lovely weekend ahead! I will love to enjoy this time of meal in this restaurant great images thanks for sharing. I love the name of this restaurant :) I'm amazed your friend waited 3 hours for a table, that takes determination, haha! I'm glad you enjoyed your lunch there, Rowena, have a lovely weekend! This food sounds so tasty!!! Oh wow....a three-hour wait now! That's cray cray! I don't know if I can wait that long for food, but I digress:P....thanks for the link above, Rowena. As someone who loves sushi, I learned a lot from that article. So amazing that Sugarfish even brews their own rice vinegar. And I didn't know that equipments have to be certified for restaurant use! I think it's amazing how dedicated the restaurant is to serve great sushi. Anyhoo, have a great weekend, chingu! Now that is interesting, sushi is actually about the rice, not the seafood? That is one thing I did not know. Plus I don't think I ever had vinegared rice at any sushi place here in Germany. I guess it's totally fine for me to say that I like sushi then because I'm not really in it for the raw seafood. I usually do sushi rolls with shellfish. But the hubs is into the raw stuff -- he always gets the sashimi. I think I knew that about sushi btw. That it is not just raw seafood but one served with vinegared rice....and I think someone also said that it is not technically 'raw' fish or seafood because of the vinegar and rice which changes the texture of the fish/seafood (I'm not sure what is the exact English culinary word for that process when a sour item makes another item sour, I know how to say in my language but not in English... anyway, a sour item is not a raw one). Not that I mind raw fish or seafood, I have ate it plenty of times- Dalmatian style. I would love to try both sushi and sashimi some day. Who knows where life might take us? It is good to know about this place. It is wonderful that the service there is very efficient and the staff very friendly. That is always important for a good dining experience. The long wait might be a problem for many, but maybe that is just a temporary thing they might sort out. I'm glad to hear you didn't have to wait long, good thing you checked it out when it was newly opened. I have always thought sushi the the whole thing, I mean with whatever the topping is and the rice combo but I had no idea it's more of the rice itself. That was an interesting fact, Rowena. Ohh I have to visit this place Rowena. I've always wanted to like sushi, but I've never acquired a taste. It is always so pretty :D Sounds like a nice place Rowena. OMG I think I’ve been to Sugar Fish in NYC, that’s so crazy. The sushi was deliciously fresh it’s hard to forget a good cut of fish. This looks so delicious! 3 hours wait?! Wow, I guess that says it all. I happen to love sushi and this sounds like a lovely place to try. The longest I believe I have waited to eat was about 1.5 hours. But this is why I like reservations, no waiting. It's nice to know that they are sensitive to people with food allergies. Lovely to keep up with you and long time blogger friends, once again! Mmmmm I've only been here once and that was two years ago in LA. I really love the quality and the fact that they said we should sit in for the hand rolls, so we did. It wasn't too bad of a wait.